Our Acrylic Donga Is Clearly As Practical As It Is Beautiful. Its Generous Size, Color And Durability Are Suited For Both Indoor And Outdoor Entertaining, And Its Eye-Catching Contemporary Design Makes An Instant Impression. Fill It With Dal Or Any Other Food Item - With This Attractive Donga On Your Table, You Won'T Need A Centerpiece. 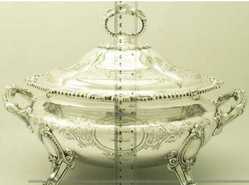 We have uniquely positioned in the market, we are counted among the best name in the market offering Crockery Items. They are beautiful and attractive in design. 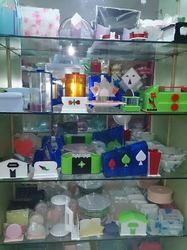 We are manufcturer in acrylic products, we customize the goods as per your reuqirement. Our Elegance Range of Opalware Crockery is designed from superior quality ingredients and are tested on quality parameters. They are stylishly built and score on quotients like beauty and optimum usage. We are offering a wide range of Acrylic crockery. We manufacture, exporter and supplier of acrylic crockery items like acrylic platter of best quality. We deals in all over India. We are best name in this niche offering world class array of acrylic quarter plate in many sizes. We are counted among the leading manufacturers and suppliers of a wide array of Acrylic Crockery Set. Latest machines and high quality material are employed in the manufacturing process of these plates. To rule out every possibility of defect, these products are inspected by our quality controllers on certain parameters.